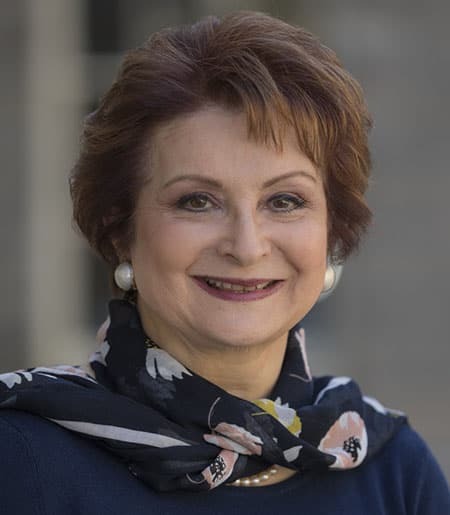 María Antonia Garcés, Professor Emerita of Hispanic Studies; Ph.D. in Spanish and Renaissance Studies from the Johns Hopkins University and M.A. in English from Georgetown University. As a transatlantic scholar, Professor Garcés teaches early modern Spanish Literatures and Colonial Hispanic American Studies. She specializes in literary theory, Mediterranean Studies, as well as historical and psychoanalytic approaches to literature. Her special field of interest centers on early modern contacts between Islam and Christianity in Spain and the Mediterranean, particularly the encounters between cultural and religious traditions. This exploration also encompasses the thresholds between autobiography and fiction in literary texts, such as in Cervantes. At present, Professor Garcés is working on the human, cultural, and economic exchanges between the Spanish Peninsula and North Africa in the sixteenth and seventeenth centuries, including the phenomena of the renegades. Her study on Cervantes’s captivity and its effects on his fiction, titled Cervantes in Algiers: A Captive’s Tale (Vanderbilt UP, 2002, 2005), obtained in 2003 the Modern Language Association of America’s James Russell Lowell Prize, the highest award conferred by the MLA to one of its members for an outstanding literary study in English. Her archival research in Spain and Italy has produced a major project on Algiers under Ottoman rule at the end of the sixteenth century, An Early Modern Dialogue with Islam: Antonio de Sosa’s Topography of Algiers (1612) (The University of Notre Dame Press, 2011). Funded by a $150,000 Collaborative Research Grant from the National Endowment for the Humanities (NEH), this project (with Professor Diana de Armas Wilson, translator) involved preparing a critical edition and English translation of two books from Sosa’s monumental ethnographic and historical work, composed during his captivity in Algiers. This riveting chronicle presents a live tableau of Algerian society at the end of the sixteenth century. At present, Professor Garcés is preparing the second volume of this work for publication: Antonio de Sosa’s History of Algiers in the Sixteenth Century (Notre Dame University Press, forthcoming). In 2016, during the celebrations for the 400th anniversary of Cervantes’s death, BBC-Culture interviewed Professor Garcés about her work on the author of Don Quixote. Cervantes in Algiers: A Captive's Tale. Nashville, TN: Vanderbilt University Press, 2002. Con cagüinga y con callana. Rescatando la cocina perdida del Valle del Cauca, 2nd ed. Bogotá: Ministerio de Cultura de Colombia, 2013, 142 pp.